During Prohibition, Carl H. Eisenmenger maintained ownership of the Bavarian Brewery at 5th & DuPont Streets. When Repeal came in April 1933, Eisenmenger immediately formed a stock company and began working on plans to revive the brewing business. 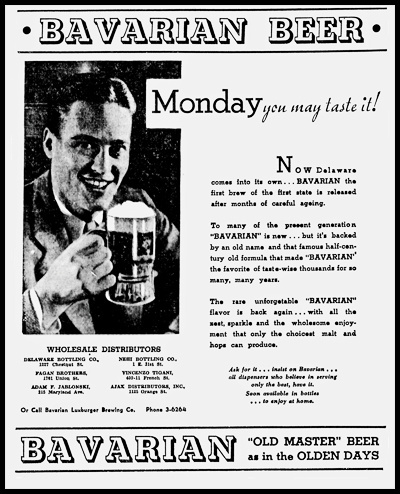 The name of the new firm was an amalgam of two of the brewery’s popular pre-Prohibition beers, Bavarian and Luxburger. It was naturally led by Eisenmenger as president and his brother-in-law, John F. Hehl, as vice-president. The Bavarian-Luxburger Brewing Company, Inc. readied the brewery for production and waited patiently while a bill made its way through the Delaware legislature permitting the production of beer. Once running, the brewery would have the capacity to produce up to 5,000 barrels a week. The firm hired brewmaster George Gress, who had worked in that same capacity at the Fineknauer Brewery in Philadelphia prior to Prohibition. Luxburger beer as well as a seasonal bock in the Spring. 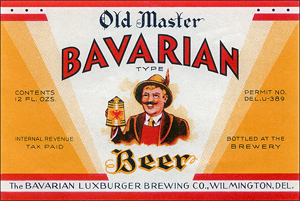 The Bavarian-Luxburger faced stiff competition from regional and national brewers, who had gained an early foothold on the Wilmington market after Repeal. The company quickly discovered that Delaware consumers were no longer as loyal to a local brand as they had once been. By June 1935, Eisenmenger and his partners decided to cut their losses and shutter operations. Eisenmenger retired to his farm in Arden and, more than two years later, found a buyer for the brewery that he and his parents had managed 1898. For the time being though, Delaware was once again without its own brewery.